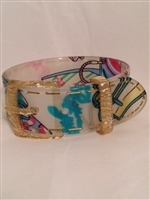 Funky gold wired cuff. Trendy and impressionable piece. 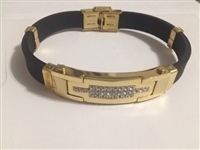 Gold Bracelet with sparkling rhinestone accents. 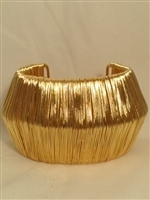 Large gold wired cuff presenting a trending edge. Adjustable for all wrist. 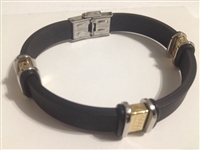 Fashionable bracelet with gold magnetic closure. 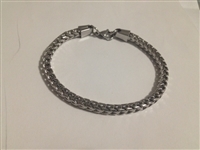 Chic bracelet with smooth interior feels great on wrist. 2 small sparkling 1/2 inch cuffs. Set includes one gold and one silver. Stack together to create bigger appearance. Fashionable enough to compliment any attire. Bold plated cuff. Edgy style with a line of dazzling rhinestones. Truly a trendy piece. 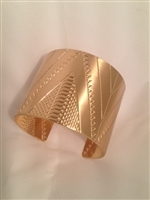 Fashion gold cuff with A symmetric pattern. Sparkling pink & peach color rhinestones set in gold / antique blend chain. It drapes the neckline smooth. Add 2 chains to give a bolder look. Perfect for casual or dressy attire. (Note: matching bracelet is not included in the set. Select item # B15320 to purchase it.) Approximately 2 inch diamond cut fashion bangle set for toddlers. Micron finish. Recommended for toddlers 2-3 years old. 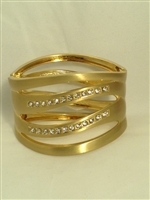 Gold rhinestone & crystal blend bangle. Dazzling beauty. Spikes up your casual attire or just the right touch for an evening affair. Grey and black rhinestone & crystal blend bangle. Dazzling beauty. Spikes up your casual attire or just the right touch for an evening affair. 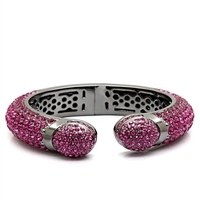 FANCY AND ELEGANT BEDAZZLED BRACELET. HIGH QUALITY CZ, CRAFTED DETAIL AND STUNNING JEWELRY. (Ring Size 7) Designed with creative details. High end cubic zirconia. Platinum overlay bracelet and ring set. These items are the perfect accessory combo. You can wear separate or together and they will still catch the eyes of true jewelry lovers. (Ring Size 9) Designed with creative details. High end cubic zirconia. Platinum overlay bracelet and ring set. These items are the perfect accessory combo. You can wear separate or together and they will still catch the eyes of true jewelry lovers. Luxury bangle. Top grade Montana blue crystals, brass and ruthenium. Solid valuable bangle. Luxury bangle. Top grade fuchsia crystals, brass and ruthenium. Solid valuable bangle. Luxury bangle. Top grade topaz crystals, brass, gold and ruthenium. Solid valuable bangle. Captivating 3 piece silver necklace set is overlay with platinum. It is fully lined with high grade cubic zirconia. Perfect if worn as a set or as individual pieces. This set stamps great taste in jewelry. 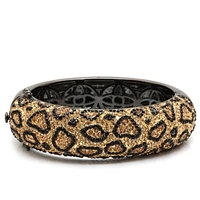 Luxury leopard bangle. 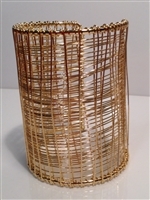 Made of brass, gold, hematite and multi color top crystals.